We’ve implemented a change to the client selection process in the invoice creation screen. Now when you click to modify the address, you can also change the recipient name. You can type whatever you like here so the recipient does not necessarily need to be listed as a client contact. This freehand version could be moved up to selecting from the list of stored client contact details to get a delivery/site address feature! But this Client Contact details card could also include a delivery/site address, department, etc. If these details could be called twice, once for invoice address (with default) and once for (additional address box) delivery/site address as described and put on the invoice/estimate form with additional notes/payment terms. Hi, I agree with the idea. I suggest the possibility of including a box for the address where the work is done (it should appear in the “all invoices” to facilitate the search for invoices). This would facilitate those who work in different places for the same agency/contractor/customer. Thanks. Is there any news on the delivery address feature? Would be really handy for a few of my big clients as their accounting offices are separate from the delivery site. There are no updates at the moment, but we’ll be sure to update this thread if there is. Many of the features we add or develop further are based on demand within the QuickFile community. Hi well I could do with delivery address column too if irs update i have client with multiple services point. yes i would vote this +1 as we could really do with a delivery address option. work around that works here, is use the “Invoice/Estimate Name” as short form address (site ref.) - not enough space to include complete address but using first line of address with postcode or locale creates sales records that can be searched by site address. We would like to see this too. This is an urgent issue. When you deliver to different store e.g. a bakery chain or coffee shop chain. Many of our features come from user feedback, so thank you for taking the time to comment and show your support for this feature. We don’t have any plans to add this at the moment. Perhaps one of our other features could help in the meantime, such as an invoice comment line? The ability to have a different delivery address to the invoice address would be very useful. we would love to see a separate delivery address section. This a very common feature on all invoicing platforms. 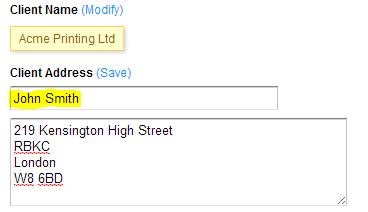 We provide furniture to landlords and estate agents, so the billing and delivery address is always different.